ER Editor: Algeria, a former French colony that was relinquished in 1962, leading to an immediate bloodbath for those Algerians who had served in the French regime, has been under the rule of President Abdelaziz Bouteflika for 20 years. Now ailing, the 82 year old is making a fifth election bid in a country that doesn’t have free elections. 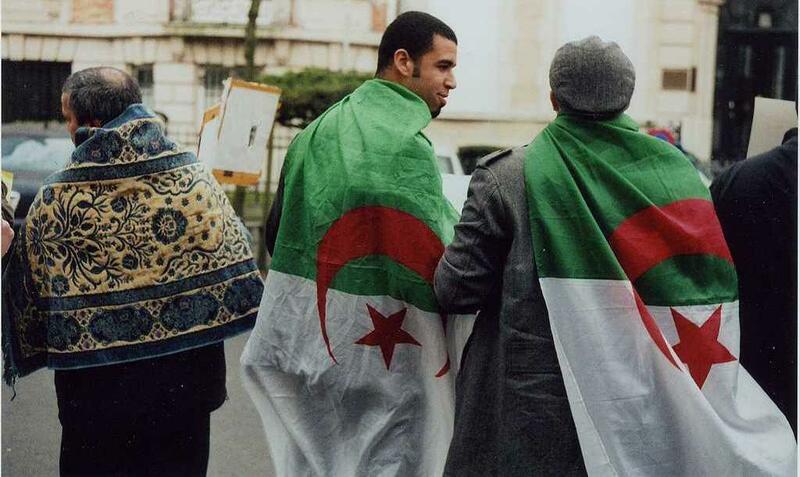 People have had enough, and in Algeria and France, Algerians are taking to the streets. Macron is in a very delicate position as Scott McConnell explains below. While the past looms large in bilateral ties, today, Algeria is considered a key French economic partner and an important ally in curbing migration from sub-Saharan Africa, and Islamist terrorism in the Sahel. Such priorities risk being compromised, some observers say, if the North African country tips into turmoil — a scenario the Algerian government now uses as a warning to protesters. France did fine after granting independence to Algeria. Algeria less so. The Algerians who had taken the side of France, fought in its army, or served as administrators of the Algerian government fared terribly—many suffered appalling deaths at the hands of the vengeful victors. According to Alistair Horne’s Savage War of Peace , 15,000 were killed in the summer after the March armistice. An important reason de Gaulle broke with his conservative army supporters and became determined to negotiate Algerian independence was that he thought the French and Algerians were fundamentally different peoples. For him, Algérie Française, the “France of a hundred million” supplemented by Algeria’s population and vast reserves of oil and gas, was total fantasy. His colleague Alain Peyrefitte quoted him as saying privately in 1959 that you could mix Arabs and French together, but like oil and vinegar in a bottle, after a while they would inevitably separate.He worried that an Algérie Française would lead inevitably to his home village of Colombey-les-Deux-Églises being transformed into Colombey-Les-Deux-Mosquées. Nevertheless, Algeria after independence remained tightly connected to France economically, not least as a principal source of “temporary” factory workers, a migration that began during the Algerian war itself. Even as the need for factory labor diminished, France instituted family reunification provisions to allow workers to marry and bring their wives to France, a provision no subsequent president was able to undo. There are now some three million Algerians in France with French or dual citizenship. France’s relationship with the Algerian government is privileged—every French president makes a state visit to Algeria in his first year of office. Trade is mutually important and Algeria plays a critical role in French African policy, as it borders Mali, Niger, and Libya. Basically everyone paying attention in France, except perhaps for Islamist militants, fears deeply the prospect of destabilization or unrest in Algeria. But it might be coming nonetheless. Abdelaziz Bouteflika, Algeria’s president, suffered a serious stroke six years ago and now seldom appears in public. Nonetheless at age 82, he (or those who speak for him) are insisting that he run for a fifth presidential term. Since Algeria’s elections are less than free, with the ruling party in full control of ballot access and vote counting, that means his victory is preordained. Since the Bouteflika announcement, hundreds of thousands of Algerians have taken to the streets in spirited but peaceful protests in cities across the country. They’ve been joined by their brethren in French cities. Few seem to know the true balance of forces in Algerian politics: there is a powerful state apparatus linked to the army, but no strong political parties. Islamists won the first round of legislative elections in 1991, which provoked the army to stage a coup that set off a brutal civil war. Six years later, a party linked to the army won legislative elections, and in 1999, Bouteflika won the presidency and initiated a form of national reunification through amnesty. It is this Bouteflika, a young vanguard of Algeria’s liberation movement in the 1960s, a conciliatory figure after the civil war of the 1990s, and now the octogenarian figurehead of a regime widely seen as corrupt, who sits atop Algeria’s structure like a cork on a bottle. And no one knows what will happen when the cork is removed. In France, President Emmanuel Macron’s government last week recalled its ambassador for consultations, and regional specialists are saying, perhaps wishfully, that the Islamists are not nearly as popular as they were in the ’90s. No one quite knows what the relevant analogies are. The Arab Spring, which led eventually to a military dictatorship in Egypt and a savage civil war in Syria, hardly seems promising. Nor does the revolt against Libya’s Moammar Gaddafi, which led, after France supported the rebels, to his death and the breakdown of Libya as a functioning state. The sad fact is that there are few attractive models for governmental succession in Arab world (one might look hopefully to Tunisia, though it’s a tiny country compared to Algeria). Sansal added that Islamists are always waiting in the wings, numerous and organized and determined. Algeria, he adds, is a conservative Muslim country. Salafism is a powerful force there, one the government has spent billions trying to counter through the development of a “true” Islam, building countless air conditioned mosques to rival the extremists. The result is that huge patches of the populace devote themselves daily to various forms of exorcism and have scant connection to modernity. Sansal (and most other commentators) insist that the army’s power won’t fail—it controls the country completely and is determined to resist any Islamist challenge. But he also acknowledges that it never really won the civil war of the 1990s, that the Islamists were never defeated politically. If Algeria were to collapse into chaos, France would be destabilized as well. The civil war resulted in a huge migration surge; this time it would be larger.Among the migrants would be a large number of Islamists, and illegal immigration would mean the French couldn’t control everyone who would come. And France, at least some quarters, is already an Islamic Republic in embryo. Official France repeats over and over its support for Algerian self-determination while fearing that Algerians will make a terrible choice, one that deprives France of a valuable strategic partner and unleashes an unmanageable migration wave. The conservative journals are full of admonitions about the need for tough-minded realism while offering few suggestions as to what this might entail. France’s population was 17 times Algeria’s in 1830, the year of colonial conquest. Now it is less than double. De Gaulle was right to say that in liberating Algeria, France would have to find something else to worry about. But 57 years later, it is proving not so easy.